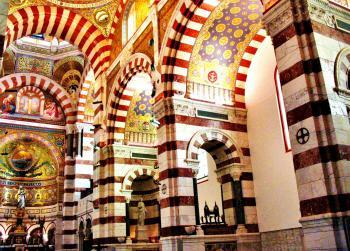 Rade de Marseille is part of the Tentative list of France in order to qualify for inclusion in the World Heritage List. We visited Marseille in June 2013, which was the perfect time because in 2013 Marseille was the European Capital of Culture, new museums were opened and historic buildings have been renovated. According to the description of the T-list entry, the proposed area includes the entire coastline of Marseille, from the artist village of L'Estaque and the old docks from the 19th century in the north to the Promenade de la Corniche and the ancient quarters in the south, and also the offshore islands such as the Ile d'If. The central area is the Old Port (Vieux Port) with its fortifications and the surrounding districts with several historic buildings. We arrived in Marseille by train from Arles (one hour). It is only a short walk from the Saint Charles station to the Vieux Port, which is the city centre and the most popular tourist spot in Marseille. It was very pleasant to stroll along the rectangular Vieux Port. Today it is a yacht harbour, but there is also a fish market at the front end and you can see the small fishing boats. Right next, at Quai des Belges, is one of the new buildings for the Capitol of Culture: a pavillon of reflective stainless steel, actually just a canopy, open on all sides and supported by slender pillars. Its mirrored surface nicely reflects the pedestrians underneath, the quay, and the water. It was one of the projects for 2013 that the traffic was largely removed from the quay and the area for the pedestrians has been enlarged. From there we went up to the pilgrimage church Notre-Dame-de-la-Garde, the landmark of the city. The Basilica is surprisingly small, less than 20 metres wide, the interior is opulently decorated with golden mosaics. But the main reason to climb the hill to the Basilica (you can also take the bus) is the magnificent view of the city, the harbour, and the sea, and also the famous Chateau d'If. On our way back to the Vieux Port we visited the very atmospheric Abbey Saint-Victor, founded in the 5th Century. On the opposite side of the Vieux Port is the Quartier du Panier, place of the first settlement of Marseille. The present houses date mainly from the 18th century. Worth seeing is the former almshouse Vieille Charité, it has a courtyard with a nice chapel and is surrounded by three storeys with arcaded galleries. Today it houses a museum and a cultural centre. Finally we went to the north-west corner of the Vieux Port, where two of the major new museum projects are located side by side on an artificial peninsula: the Villa Méditerranée and the MuCEM (Musée des Civilisations de l’Europe et de la Méditerranée), both are dedicated to the Mediterranean culture. One building is white, the other is black, both buildings have the same height, both are surrounded by water and their back sides form a line. One might think that this is the result of a coordinated planning, but the two buildings are rather the symbol of the competition between the city of Marseille, which built the MuCEM, and the Regional Council of Provence-Alpes-Côte d'Azur, which is responsible for the Villa Méditerranée. The similarities between the two structures can be explained by the laws of monument protection. The dimensions and the height of the buildings were limited, neither the view of the fortress Saint-Jean nor the urban silhouette should be affected. It is a bit strange that the two modern buildings are so close to each other, but each is exceptional in its own way. The Villa Mediterranea, complete in white, is a hook-shaped structure with a large cantilever upper floor. 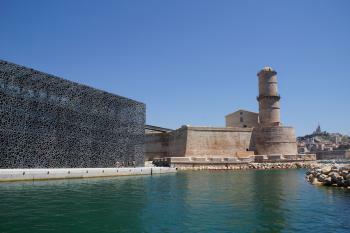 In contrast, the MuCEM is a black cube with a glass façade and on two sides with a black latticework made of concrete. We have not visited the exhibition in the MuCEM, the museum was opened only a few days before our visit and the queue at the ticket office was very long. But the roof terrace is accessible via a ramp between the glass façade and the concrete structure. The roof of the MuCEM is connected by a footbridge with the Fort Saint-Jean, a second footbridge leads to the Panier quarter. Fort Saint-Jean is also part of the museum. It was restored recently and is now for the first time open to the public. We talked to some locals, they were very excited about the restored fort and the new views of their city and the harbour, though some also complained about the costs for the new museums. The photo shows the Fort Saint-Jean and a part of the MuCEM. I do not know whether Marseille plans a nomination after the efforts and costs for the European Capital of Culture, but I think it would be a worthwhile addition to the list though city centres are already well represented. The historic quarters, the old harbour and the seaside is a charming and unique combination. And the modern architecture is an exciting contrast to the historic fortifications. It's very pretty, and there is an atmosphere: with beautiful boats, Notre Dame de la Garde, seafood, local products market on Sunday morning, beautiful creeks. The water is turquoise, you can see even fish. Beware of restaurants that are very "touristy". What a beautiful port, the fortifications, the chapel, basilica, and the promenade. This is most definetly a scenic site on the Mediteranean worth preserving. However, world heritage status for another historic centre in France is unlikely. I enjoyed my visit, but I don't expect to see this port on the world heritage list anytime soon. The highlight of my visit was the Basilique de Notre Dame de la Garde, which is perched on a hilltop that overlooks the entire port. The interior of the basilica is stunning. My visit to the Rade de Marseille was methodical in the fact that I covered almost every corner of the port, and most of the key sites. Mixed with perfect weather and interesting history, I very much enjoyed my time here.